Featuring a full range of home appliances by Whirlpool, Maytag, Amana, Kitchen Aid, Frigidaire, Crosley and Speed Queen. Now through April 30th, save $4 per gallon on Pittsburgh Paint’s Pure Performance line of interior paints. We offer interest-free financing on these units, or we can arrange a lay-away program to fit your budget. By the bag or by the ton. Delivery available. Don’t wait, buy now! In 1848 F.F. Fifield came to Camden from Williamstown, NY and established a hardware business. In 1870 W. H. Dorrance, a clerk in the store purchased a part interest in the business. The shop carried agricultural implements, fertilizers, paints, plumbing accessories and a whole variety of necessity products for the day. In 1933 Joseph McFern purchased the business and maintained ownership until 1944, when it was sold to Bud and Thelma Carpenter. After Mrs. Carpenter’s passing in 1989, John Plumley acquired the store, having begun his affiliation with the business in 1942 at the age of 13. The store was open for business when Abraham Lincoln was President… and has survived world wars, depressions, recessions, and massive changes in the home improvement industry. Today over 170 years later, the same store in the same location still exists. Just think, the issue of slavery in the 1860’s was discussed on the same wooden floor that you will shop on today! Jim and Danielle Plumley are the sixth owners of Carpenter’s Paint & Hardware, having acquired the business in 1994. We invite you to come in and take a refreshing stroll back in time and find everything you’ll need for your home, all at reasonable prices offered by a courteous and helpful staff. 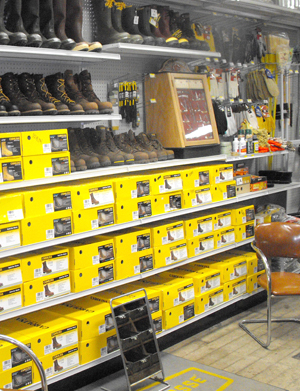 Carpenter’s Hardware takes great pride in remaining a true old fashioned hardware store. Just like 160 years ago, the store today still carries unique items such as, propane Gas Lights, Iverson and Tubbs Snow Shoes, generators, camp stoves and Peavey brand woods tools, just to mention a few. Servicing all the needs of Western Oneida County and beyond, our customers know we service what we sell and their satisfaction is guaranteed. Carpenters carries items customers would never be able to find in one of those large chain stores. Items you need but can’t find anywhere else. Carpenter’s Hardware takes pride in offering made in America home appliances and is one of the oldest Maytag dealers in the country. We recently added the Speed Queen line of washers and dryers to our product mix and they offer the best warranty in the business. Need an appliance quote? Call or email us anytime. Free delivery, installation and removal of your old appliance.